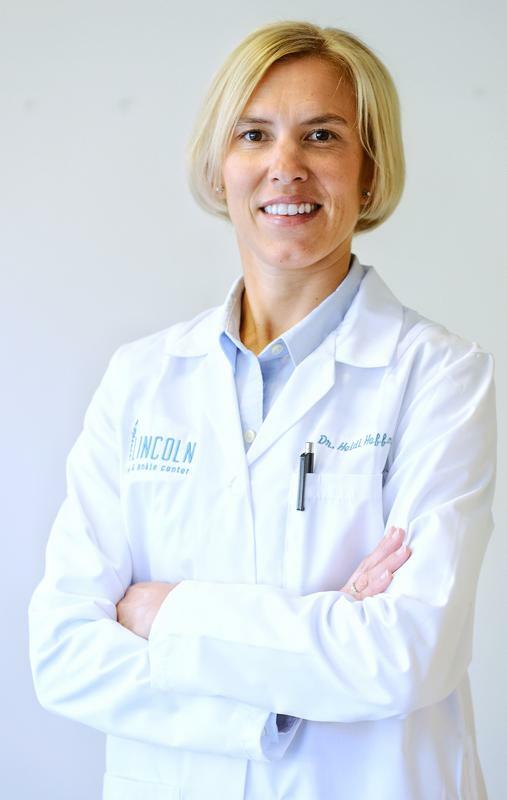 Dr. Heidi Hoffmann is thrilled to join Dr. Kaye Lagdaan at Lincoln Foot and Ankle Center. For more than 13 years, Dr. Hoffmann has been providing quality podiatric care for patients in the Chicagoland area. She practices general podiatry with a focus on wellness and takes pride in the personal touch she gives her podiatric patients. Dr. Hoffmann provides both surgical and non-surgical care of the foot and ankle. With her move to Lincoln Foot and Ankle Center, Dr. Hoffmann will bring her expertise to her own community on the north side of Chicago. She’s an active member of the community acting as the board secretary for the Friends of Ravenswood School. Dr. Hoffmann is also a member of Grow 47 and Grow Community, which are initiatives to help support neighborhood public schools that anchor great communities. Dr. Hoffmann is on staff at Thorek Hospital and Medical Center and Alexian Brothers Medical Center. She’s a member of the Illinois Podiatric Medical Association, American Podiatric Medical Association and the American Academy of Podiatric Sports Medicine. She is board certified by the American Board of Multiple Specialties in Podiatry. Born in Milwaukee, Dr. Hoffmann graduated from Drake University in Des Moines, Iowa, with a degree in biology. She moved to Chicago to complete her graduate degree at Dr. William M. Scholl College of Podiatric Medicine at Rosalind Franklin University of Medicine and Science formerly known as Finch University. She completed a two-year residency in podiatric medicine and surgery at Thorek Hospital and Medical Center. As part of her professional investment in wellness, Dr. Hoffmann volunteers at the Bank of America Chicago Marathon and the Avon 39, a walk to end breast cancer. Dr. Hoffmann is the mother of two active boys and is married to a Chicago firefighter. In her free time, she enjoys watching her boys play soccer, baseball and basketball. She also likes to run, swim and play volleyball. Dr. Hoffmann returns to her home state of Wisconsin to escape the hustle and bustle of urban living and to cheer on her Green Bay Packers!